Returning to Wonderland, Alice attempts to reunite The Mad hatter with his family. The Carroll estate may be counting the cash, but I suspect old Lewis is turning in his grave at the thoughts of his little book of wonder being transformed (oh, that reminds me, there are Transformers in this - no, seriously) into this soulless sequel. If Burton's film was a poor man's Wizard of Oz, this is a second rate Return to Oz. 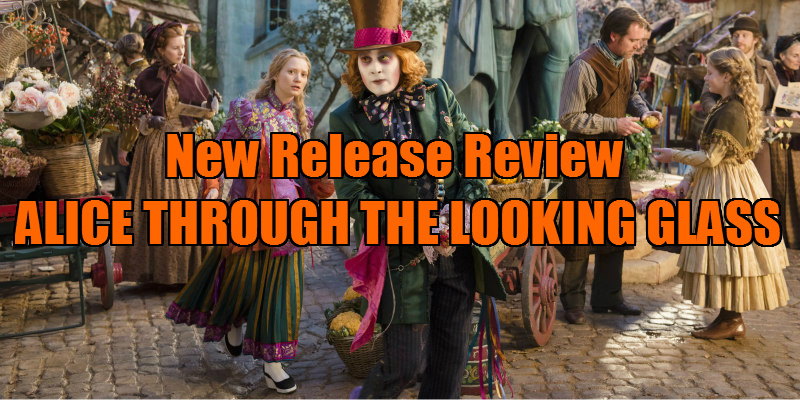 Old fashioned English eccentricity meets contemporary Californian commercialism in this cynical sequel to Tim Burton's 2010 Alice in Wonderland, a surprise smash hit that raked in over a billion dollars at the global box office. 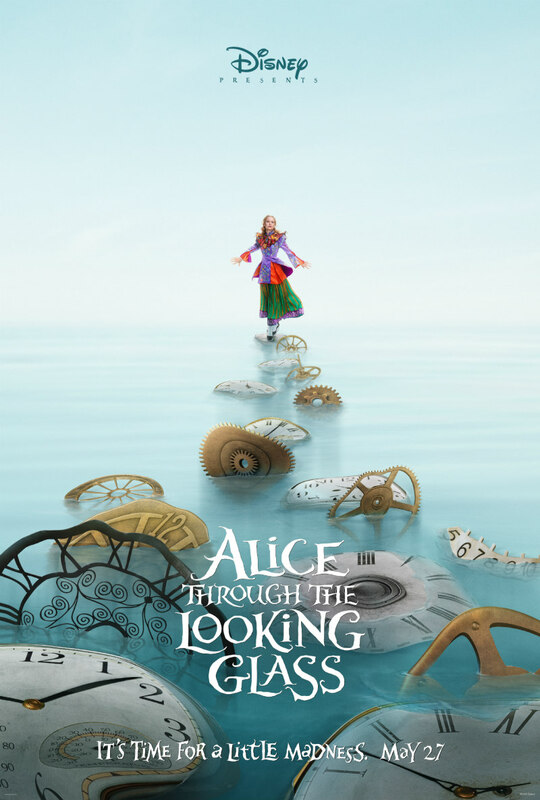 The title of this one is merely a selling point as the film dispenses almost completely with Lewis Carroll's original work. Alice, played once more by Mia Wasikowska, does indeed cross through a looking glass, but that's pretty much where the comparison ends. Before Alice makes her return to Wonderland we're forced to sit through some unnecessary guff about her attempting to save her father's sailing company. Far from the mild mannered young lass of Carroll's work, here Alice is a twenty-something captain of a sailing vessel, as the movie attempts to reposition her as some kind of Katniss Everdeen figure. Once in Wonderland - indistinguishable from Oz as seen in Sam Raimi's Oz the Great and Powerful, as though both movies shared the same digital backlot - Alice discovers The Mad Hatter (Johnny Depp, continuing the Michael Jackson on meth routine he's been cultivating for far too long now) is down on the dumps because he found the first hat he ever made as a child and it's convinced him his family are still alive. Wait, shouldn't that cheer him up? I couldn't make sense of this either, but then I couldn't make sense of anything in this movie. The film then makes the colossal amateur error of unravelling a time travel plot in a fantasy world. This makes no sense from a storytelling perspective. When Marty McFly travels back to the 1950s, we know this immediately as we have a familiarity of what the '50s looked like. We don't have a clue how Wonderland changed over several eras however, making Alice's time travelling largely redundant. Presumably not having watched Terminator: Genisys, the filmmakers have decided what Carroll's book needed was less wonder and more poorly thought out time travel. Oh, and Sacha Baron Cohen mugging it up with what seems to be an awful Cristoph Waltz impersonation. Thanks to Cohen, Depp is no longer the most annoying presence in this franchise. There's a lot made of Alice's reinvention as some sort of feminist icon - recounting her experiences in Wonderland, she is diagnosed with hysteria - but all this is negated by the film's constant mocking and villainising of Helena Bonham Carter's Red Queen purely on the grounds of her physical appearance. One step forward, two steps back. As with Carter, Anne Hathaway is here for no other reason than the film could afford to pay her, and she looks as uncomfortable in her White Queen outfit as Ally Sheedy in her Princess get up at the end of The Breakfast Club. As an adult I couldn't wrap my head around the ridiculously over complicated plot, despite the constant Alice-splaining, so how kids are expected to immerse themselves in this is beyond me. Perhaps parents can later use the DVD in place of a bedtime story, as this will send children to the wonderland of sleep within its first half hour.